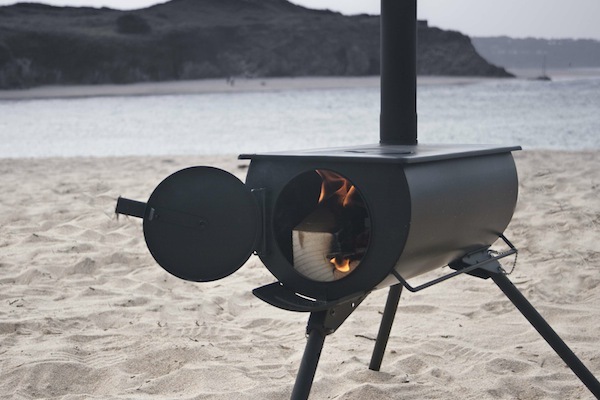 The Frontier Campstove is a really fun and ecological alternative to a gas fired appliance. The stove consists of a simple half-barrel metal firebox with a roomy cooking plate that provides plenty of cooking space for a family or a group of friends. The standard kit comes complete with 2m of single skin stove pipe with integrated damper to control heat-loss and improve efficiency. An adjustable air vent on the firebox door ensures the air flow can be accurately regulated for a clean effective burn. Our price includes for a quality Carry Bag. The Frontier Camp Stove is compact and suprisingly portable with the standard kit weight of only 10kg (approximately). It takes less than three minutes to assemble and is easy to light and maintain at cooking temperature. Each Frontier Camp stove comes with simple assembly instructions and a guide to safe use. Each Backwoods Campstove comes complete with assembly instructions and a simple guide to safe use. The image below shows Frontier Camp Stove Bag with Optional Water Heater Bag on top.